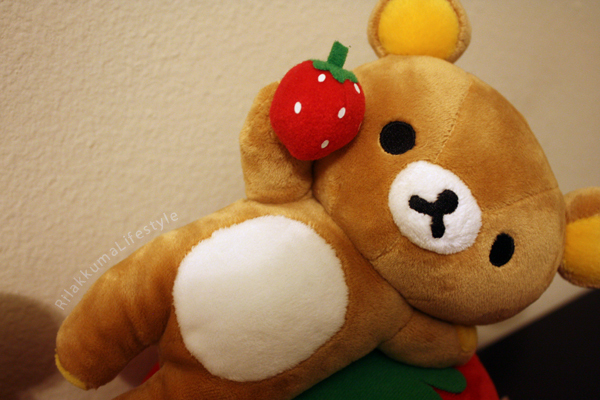 Fansclub Strawberry Rilakkuma Plushies! + JAXA collab, Funny Parts Series, and more! 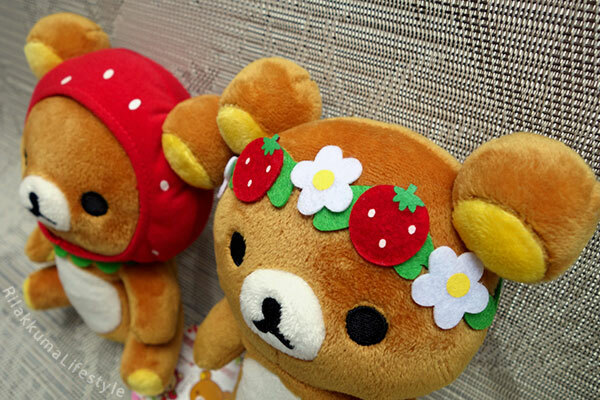 What better way to celebrate strawberry season than with these awesome Fansclub Strawberry Rilakkuma Plushies! 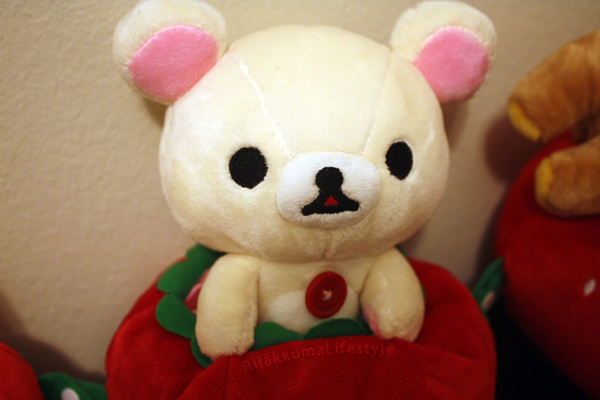 A beautiful crown of strawberries and strawberry blossoms for this Rilakkuma! And a snug strawberry hood for this bear! Tag art featuring Korilakkuma picking up a huge heart-shaped strawberry! Lovely! And what a dynamic duo! I like to think they became best friends over their mutual interest in strawberry headgear hehehe. These blissful strawbears were released as part of the “Strawberry Series Part2” by Fansclub in March 2010. Gigantic thank you to reader Trinie for this seasonally perfect pair of bears! What a splendid set, and they’re joining a strong and diverse community of strawberry bears! Lots of cool Rilakkuma things to look forward to: check out the JAXA Rilakkuma plushie! I missed posting about this guy because I got swept up in the Dr. Yellow line, wow, isn’t he fly? Like the Dr. Yellow series, this cute JAXA worker comes out on July 19, and costs 2,484円. As Ariel mentioned in her post, JAXA stands for “Japan Aerospace Exploration Agency” and they’re responsible for satellite launches, asteroid exploration and much more! With the Space Series coming out this month, this collaboration fits perfectly! I actually live really close to the Kennedy Space Center – maybe I need to take my astronaut Rilakkumas for a visit hehehe. In case you’re still craving more Rilakkuma news, San-X will also be releasing a new line of Rilakkuma merchandise for the Rilakkuma Funny Parts Series! Looks like this theme features our favorite parts from our favorite bears – look forward to this release in August 2014! I think the Rilakkuma mug is really clever, though I guess you have to hold the mug up to your nose for it to really look like you have a Rilakkuma snout haha. And for those interested, I’ve finished the first part of my collection page! Just the San-X and Lawson ones are done right now, but I hope to finish the rest of the plushies over the next week or so. One my webpage, my running collection will be recorded on the top menu bar (“Collection”), and provides information about series and release date, as well as their original posts on my blog and San-X page. Hope y’all enjoy it! 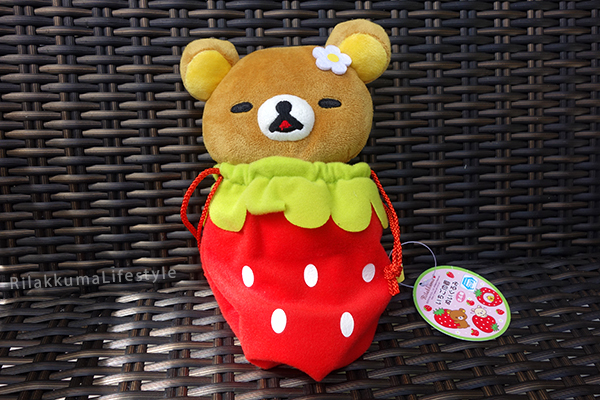 Summer means strawberries, so say hello to our new Strawberry Bag Rilakkuma! 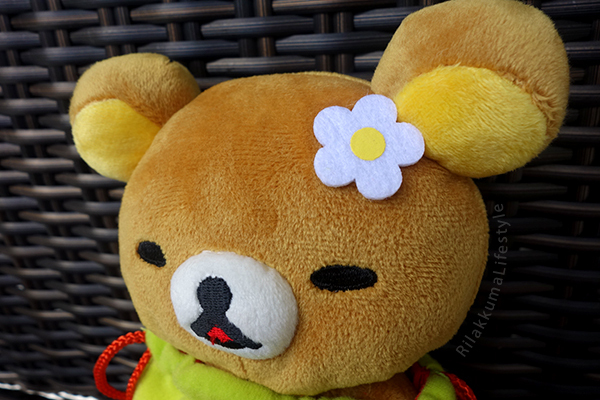 Sleepy Rilakkuma in the summer sun! A beautiful strawberry blossom on his ear! 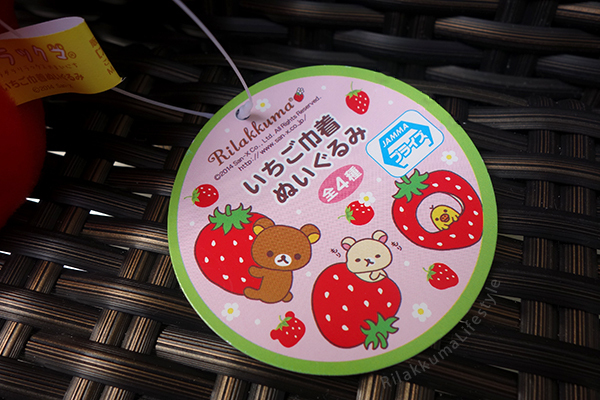 Rilakkuma and pals enjoying some delicious (and gigantic) strawberries on the tag! 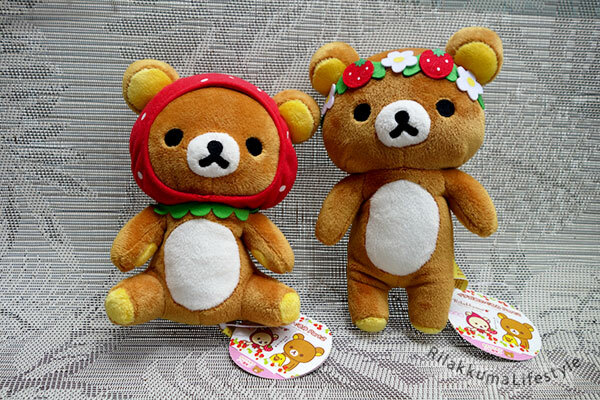 Strawberry Bag Rilakkuma joins a long tradition of strawberry-themed bears in the collection! Wow, super cute! He looks super snug in his strawberry sleeping bag – pretty perfect theme for a summer nap! 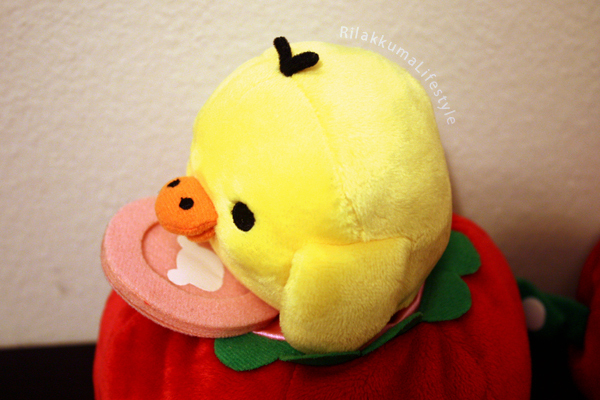 This sleepyhead is part of the Fansclub’s Strawberry Bag Series, released in January 2014. This super adorable strawbear bag was a prize from Mira Plush’s I Love Rilakkuma contest! 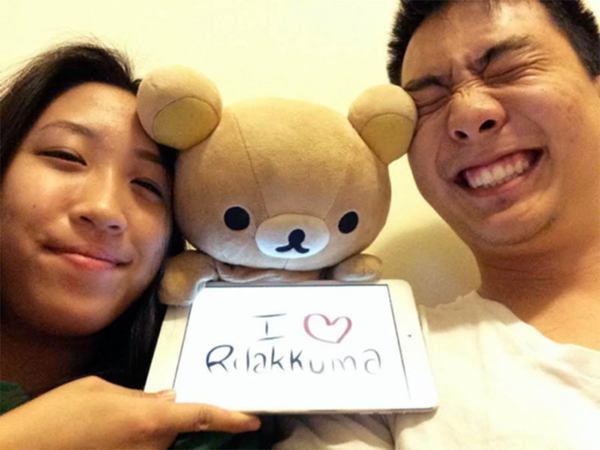 For this contest, participants held up a sign that said “I love Rilakkuma” to be entered in a drawing – awesome idea! Check out the video of all the submissions here (Simon and I are around 0:43)! Follow Mira Plush’s WordPress blog and Facebook page to learn more about their future contests! And of course, be sure to browse through Mira Plush’s online store to get this bear and many more (on sale since it’s Mira Plush’s anniversary!). Thanks so much for your continued involvement with the Rilakkuma community and HAPPY ANNIVERSARY, Mira Plush! Teehee, they’re so cute and round! If I played golf, I’d totally invest in these! They feature standard (naked) Rilakkuma and Korilakkuma, as well as Bee Rilakkuma and Bunny Suit Korilakkuma! I’m so happy to be done with school for the summer! Hopefully, this means more time for Rilakkuma things while I have the free time. Finally being able to relax like Rilakkuma is an incredible feeling! Tokyo Station Rilakkuma Store Opening Plushie! 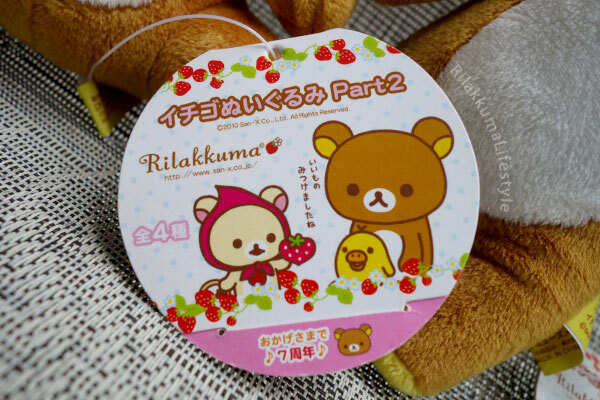 Since things are kind of quiet on the Rilakkuma plushie front recently (well, except for the Yamanote release), I’ve been spending a lot of time looking at the older series on the Japanese auctions! 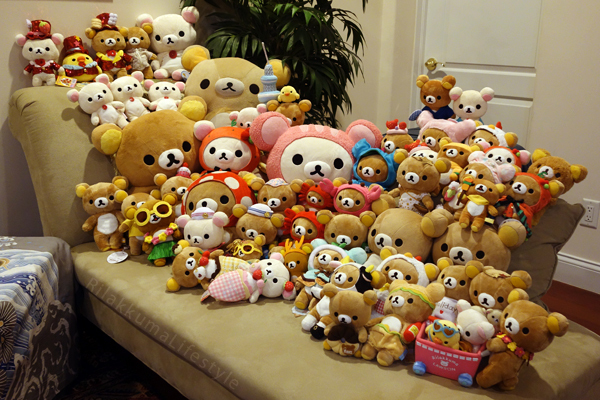 After compiling my Rilakkuma Reference Sheet, I was so excited to see and recognize so many of the plushies up for bid! It’s so exhilarating to recognize really old series and rare finds! 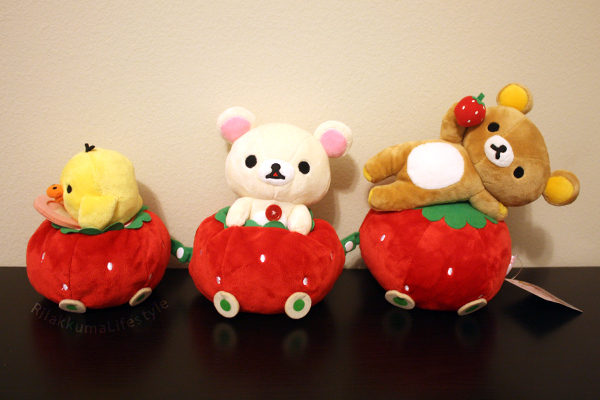 So check out my newest addition: the Rilakkuma Strawberry Car! The cars are all separate plushies, and can be connected into one big car by little snaps! Kiiroitori leads the way with a Rilakkuma steering wheel! Kiiroitori and Korilakkuma’s seats are lined with pink satin. Rilakkuma doesn’t sit in a seat, but just kinda lays on top of the caboose. 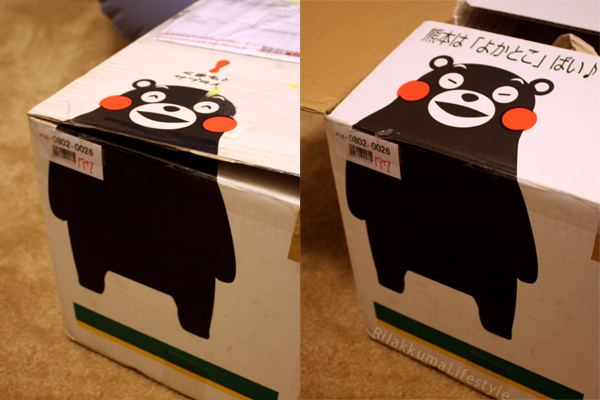 They also came in this wacky but somewhat appropriate Kumamon box that shows different faces of Kumamon (mascot of the Kumamoto prefecture, not the Digimon) depending on which flap is showing. 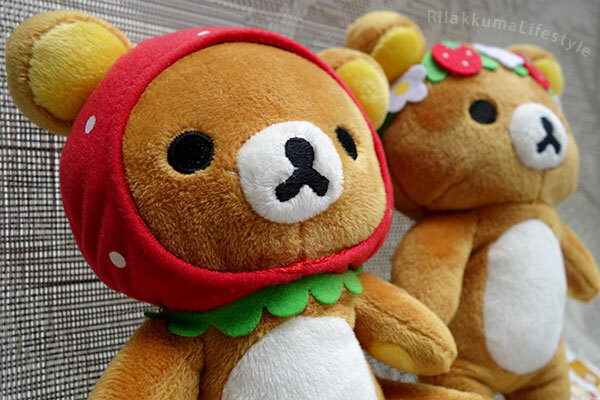 This release coincided with the Rilakkuma theme at the time, the Strawberry Series. I find this set so interesting since this was one of the earliest Rilakkuma Store-specific plushies! It’s so wild that there have been six new Rilakkuma Stores that have appeared since this plushie came out. As of right now, this is my oldest plushie!! It seems like there are so many when they’re pulled out of their boxes! Though I JUST got another shipment sooo… haha this isn’t even the most updated family portrait, but it’s as good as it’ll get! Wow, I can’t believe it hasn’t even been a year since I started collecting!